An uber syrup-sweet herbal tea with an unbelievable aroma. Open the bag and allow your senses to go into overdrive with the heady fragrance of aniseed, liquorice root*, star anise and blue mallow flowers. Think back to old-fashioned liquorice torpedos... this tea is a childhood memory in a cup. For anyone trying to beat sugar cravings, this naturally sweet tea is your saviour. (*contains liquorice root – people with high blood pressure should avoid excessive consumption of this tea)(*contains liquorice root – people with high blood pressure should avoid excessive consumption of this tea). Leaf: Liquorice chippings, whole star Anise, whole aniseed, blue mallow flowers. 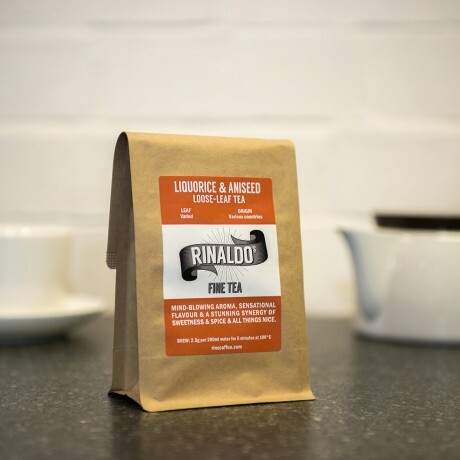 Cupping Notes: Liquorice, aniseed and very sweet. Brewing Tips: 2.5g in 200ml of water at 100°C. Steep for 5 mins.